Evan Mawarire, in yellow, arrives at a Harare court. Zimbabwean authorities on Thursday 17 January 2019 charged His Generation Church leader and pro-democracy campaigner Pastor Evan Mawarire with subverting a constitutional government following anti-government protests staged to show dissatisfaction with President Emmerson Mnangagwa's mismanagement of the economy. Zimbabwe Republic Police (ZRP) officers had on Wednesday 16 January 2019 charged Pastor Mawarire with incitement to commit public violence as defined in section 187(1)(b) of the Criminal Law (Codification and Reform) Act after the law enforcement agents arrested him at his Harare residence. But on Thursday 17 January 2019, ZRP officers amended the charges to include subverting constitutional government as defined in section 22(2)(a)(iii) of the Criminal Law (Codification and Reform) Act as well as public violence as defined in section 36(1)(a) of the Criminal Law (Codification and Reform) Act. The State claimed that the clergyman, who is represented by Beatrice Mtetwa, Tonderai Bhatasara and Doug Coltart of Zimbabwe Lawyers for Human Rights, acted in connivance with Zimbabwe Congress of Trade Unions President Peter Mutasa and recorded and published a video to the Zimbabwean populace, which went viral on social media platforms accessible to all Zimbabweans living in the country and to the entire world. The contents of the video, the State alleged, were meant to subvert a constitutional government in that Pastor Mawarire and Mutasa were coercing Zimbabwean workers to embark on a work boycott and encouraging civil disobedience and resistance to the country's laws. Pastor Mawarire was also accused of attempting to coerce the government by giving it demands that the work boycott or civil disobedience would only end if government attends to their demands which included addressing economic challenges, paying workers' salaries in United States dollars and removing bond notes. State prosecutor Mirirai Shumba charged that Pastor Mawarire's alleged utterances recorded on video allegedly caused members of the public to commit acts of public violence and rampant looting. The State said it will use a laptop and an iphone mobile phone handset recovered from his residence as exhibits during his trial. 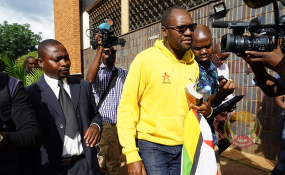 Pastor Mawarire, who briefly appeared in court on Thursday 17 January 2019 returns to Harare Magistrates Court on Friday 18 January 2019 for continuation of court proceedings before Harare Magistrate Lucy Mungwari, who is expected to deliver a ruling on an application filed by the clergyman's lawyers challenging his placement on remand. The defence lawyers argued that Pastor Mawarire did not commit any offence warranting his arrest. This is not the first time that Pastor Mawarire has faced charges of subverting constitutional government, incitement to commit public violence and committing public violence as he was once charged for breaching these laws in 2016 and 2017, when he was accused of inciting Zimbabweans from "all walks of life either locally or internationally" to revolt and overthrow former President Robert Mugabe's administration.